"Mystery of the Vanishing Homes" is the 49th Mandrake Sunday story. The story was written by Lee Falk and drawn by Phil Davis. Three home owners claim their homes have disappeared overnight, stolen without leaving any trace. The Police Chief call Mandrake for help with this mysterious case. 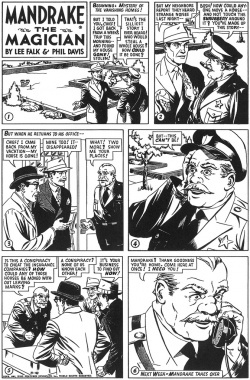 The title for this story is taken from the strip of March 18, 1951 (Beginning: Mystery of the Vanishing Homes !). This page was last edited on 25 June 2017, at 16:40.